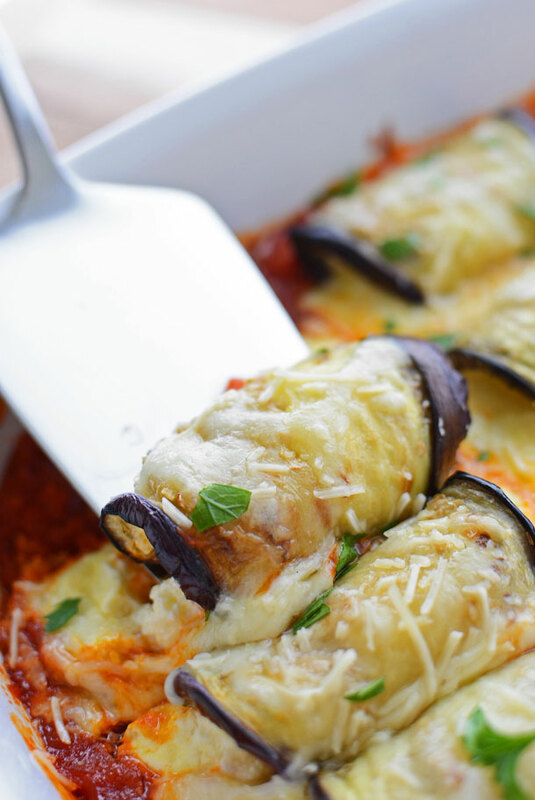 Eggplant Stuffed Shells – This family-friendly recipe combines the flavors of two amazing Italian favorites, but it’s naturally lighter and still bursting with cheesy goodness! In the area where I live there is a thriving Italian American community, so all kinds of saucy goodness are in ample supply. As a visiting nurse I have the privilege of spending time in many of the homes in my community with people from all different ethnic backgrounds, and I’ve come to love some of the Italian traditions and values that help to shape my hometown. Things like the importance of family, speaking your mind, and giving lots of good food to people you like. 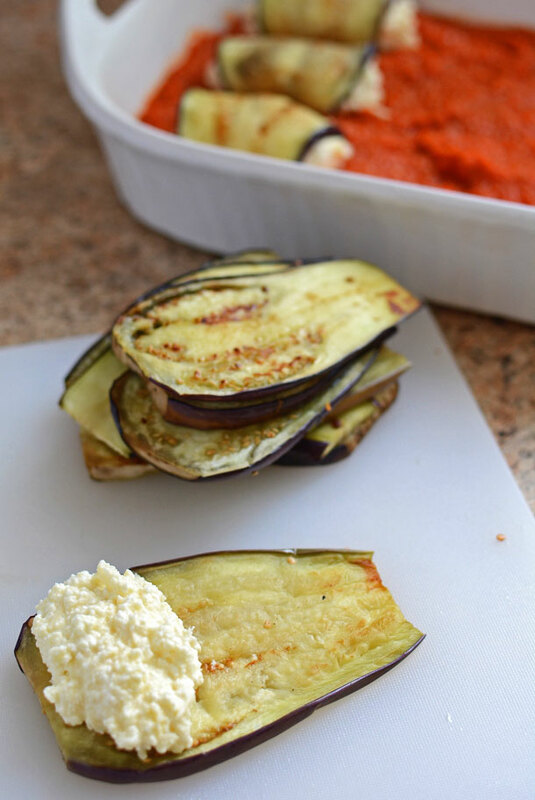 A couple of my favorite classic dishes are stuffed shells and eggplant parmesan. 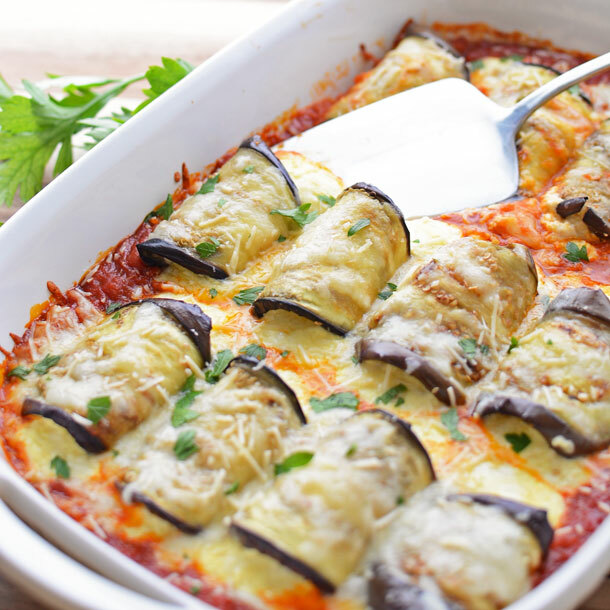 Today’s recipe for Eggplant Stuffed Shells, also known as eggplant rollatini, is a combination of those two recipes. Both are traditionally pretty heavy with the pasta in the stuffed shells and the breaded and deep fried eggplant in the eggplant parmesan. By combining them I ended up with a lighter dish without sacrificing a bit of stretchy, cheesy goodness or flavor. Part of the secret to this dish is having amazing ingredients. I got both my eggplant and marinara from my friendly neighborhood CSA. The eggplant was fresh and firm (not always easy to find at the grocery store), and the marinara was thick and pasty with intense flavor despite having no sugar added. For my cheese, I purchased fresh parmesan and I got a low-moisture mozzarella, which is super stretchy when it melts. 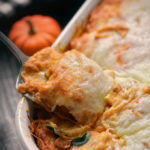 To create eggplant stuffed shells, you simply make them like traditional stuffed shells, except that you substitute the pasta with eggplant that has been softened by lightly cooking it on a skillet. This means less carbs and calories, plus it will help you get your 7-a-day of fruits and vegetables! After your dish is assembled, simply pop it into the oven, pour a glass of wine, and relax until it’s bubbling and all of the cheese is melted. This dish does well if you prep it in advance. 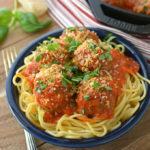 Like eggplant parmesan it will hold up in the freezer, so for the busy cook it’s great for making in big batches and stocking up for later. After you’re done lazily sipping on wine and relaxing while your dinner bakes, you’re sure to have some bubbling, saucy, stretchy cheese-adorned eggplant. 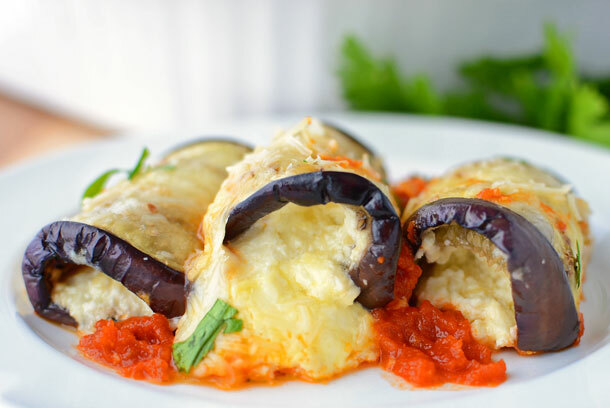 Eggplant Stuffed Shells, aka eggplant rollatini, combines two amazing, but heavy, Italian favorites. 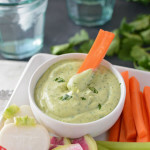 It's naturally lighter yet still bursting with flavor and cheesy goodness! Cut the eggplant into 12 lengthwise slices, about ¼" thick. Lightly brush the eggplant slices evenly on both sides with olive oil. In a skillet over medium heat, cook the eggplant for 1 to 2 minutes on each sides until it begins to soften, and then set aside to cool. While the eggplant slices are cooling, stir together all of the ingredients for the cheese filling in a medium mixing bowl. Pour 1 12 oz jar of tomato sauce into the bottom of a casserole dish. I selected the thickest sauce I could find as eggplant tends to release some water, and I didn't want to end up with a water sauce after baking. 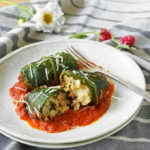 Place a heaping tablespoon of cheese filling in the middle of each cooled eggplant slice and roll the ends together to form a "noodle" like a manicotti shell. 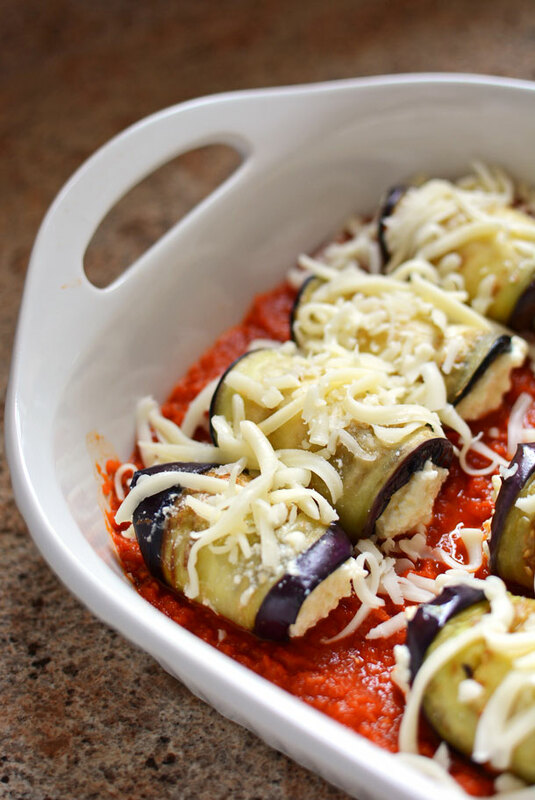 Arrange the stuffed eggplant in your casserole dish on top of the marinara. Finally sprinkle with ½ C of mozzarella. Bake at 375ºF for 20-25 minutes or until the cheese is melted and the dish is bubbling and heated all the way through. Allow it to sit 3-5 minutes before serving. 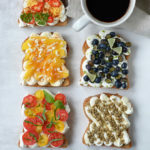 WOWED these look amazing. I have never thought to make eggplant ‘shells’. LOVE! Found your blog on the inspire me Monday link party. Love your layout and great photos! I love link parties! Thanks for the compliments! I’ll be sure to head over to your blog! 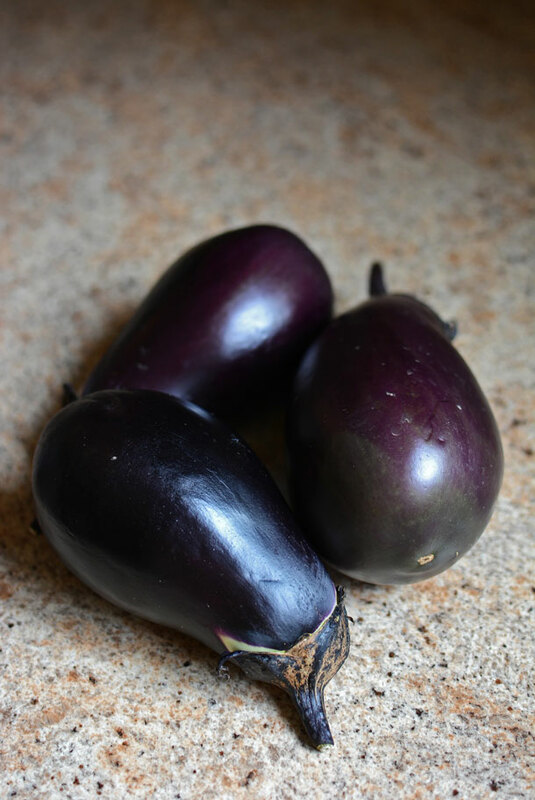 My husband loves eggplant – what a great recipe!! Oh, I love these. 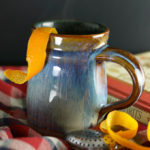 I make something similar, a recipe I got while on holiday in Sicily. Instead of mozzarella they used processed cheese slices. I actually never buy this kind of cheese except for this particular aubergine recipe. Heaven! 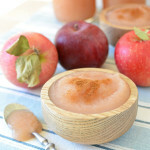 It’s such a simple recipe, but so good! Sicily must have been an amazing holiday! Love the idea of eggplant shells. I’ve seen eggplant lasagna, but never thought of shells before! Thanks Emily. The eggplant doesn’t make it taste like I was trying to lighten-up the dish one bit! Nice idea and looks scrumptious, but out of curiosity, are you aware of the term/recipe called Eggplant Rollatini? Basically the same thing! Completely unaware! Thanks for the feedback Nicole. I’ll add rollatini to my tags, which will make it easier for people to find! 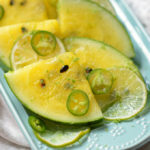 This is gorgeous and sounds so delicious. Who needs shells when you have eggplant?! 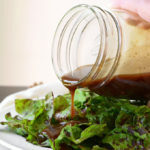 Looks fantastic and this recipe is a diabetics dream !! 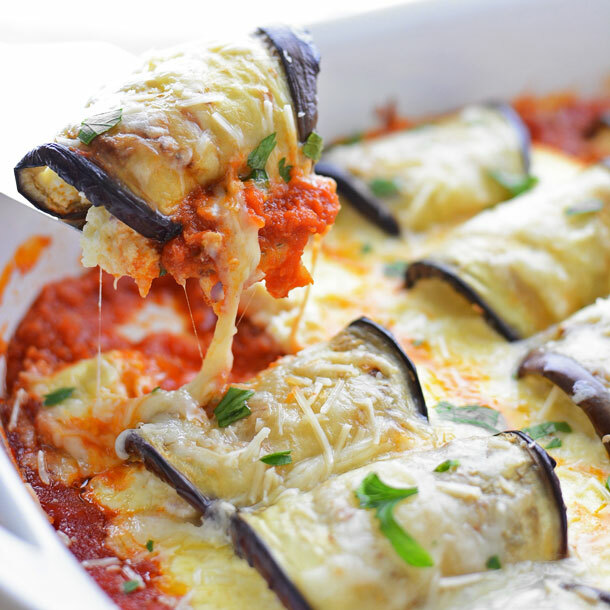 I never would have thought to use eggplant for stuffed shells … Brilliant !! This is great. Can you also help me with an alternative for the cheese stuffing? something healthier? 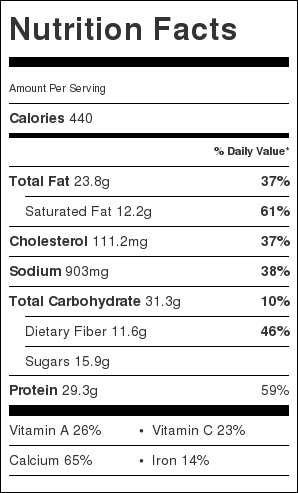 What brand of sauce do you use ? It all like looks so good! It’s amazing! 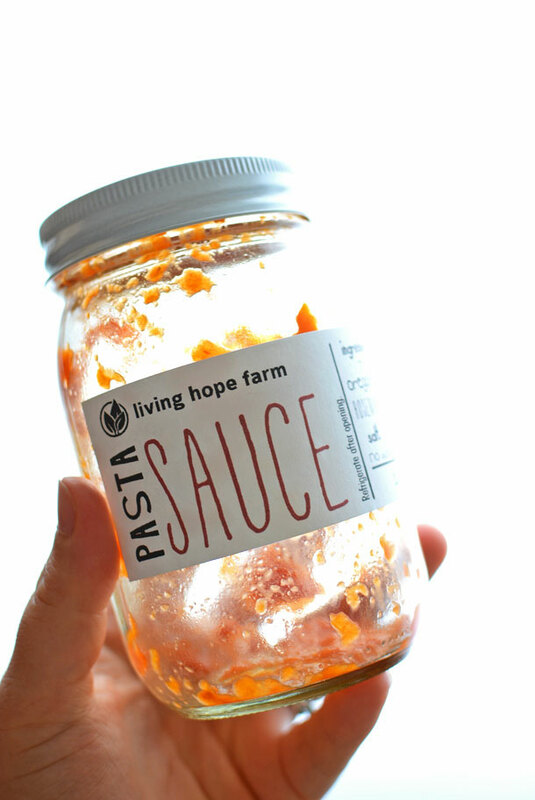 It’s made by a farm near my how from their own tomatoes.